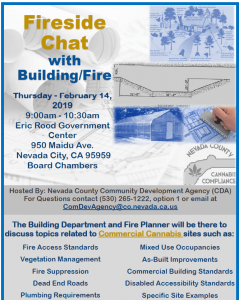 February 11, 2019 – Are you planning on completing commercial cultivation activity in Nevada County as a new or existing cannabis farmer and want to learn more about building and fire regulations for this type of activity? 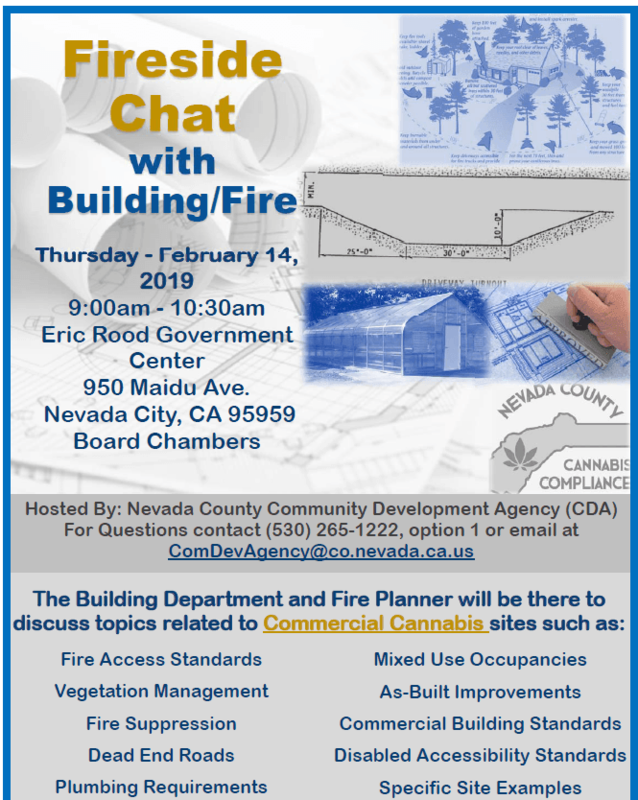 The Nevada County Building Department and Fire Planner will be hosting a Permitting Workshop on February 14th from 9:00 a.m. to 10:30 a.m. in the Board Chambers at the Eric Rood Administration Center to review building and fire code requirements related to commercial cannabis activity. Topics range from use and occupancy types for structures, disabled accessibility requirements, fire access requirements, and more. There will be a question and answer session with County staff during this event. Find the event flyer and learn more about Nevada County cannabis regulations visiting the County’s Cannabis Conversation webpage. To learn more about state cannabis regulations visit the CalCannabis webpage. If you have any questions about local cannabis regulations please do not hesitate to contact the Nevada County Cannabis Compliance Division at (530) 265-1222 or email us at cannabiscompliance@co.nevada.ca.us. Previous articleCalifornia made it hard to avoid vaccinating kids. Medical waivers have tripled. Now what?